ACOUSTIC EXPO 2014: Luthier Michael Millard founded Froggy Bottom guitars in 1970 following his time as foreman at Gurian Guitars. Since then the quality of his work (and that of the builders who have subsequently joined the Froggy Bottom team) has become recognised worldwide. With their elegant, traditional lines, you'd be forgiven for thinking that these guitars are clones of the early 20th Century Martin/Gibson designs. However, Froggy Bottom guitars are capable of the sort of 'responsivity' and quality of tone often associated with more modern-styled instruments. Tonally rich, powerful and extremely musical, these are very special guitars. The Froggy Bottom M model is one of their best sellers and, after playing the first notes, it's easy to see why. Immediate response, wide dynamic range and sweet tone make this a wonderful instrument for fingerstyle and flatpicking alike. We're big fans of the smaller bodied Martin guitars of the 1920s, especially the all mahogany models such as the 0-17, but wouldn't it be wonderful if you could marry that woody tone with modern response and fit and finish? This Froggy Bottom P14 Deluxe does just that. With east Indian rosewood back and sides, plus an adirondack spruce top, this D14 Deluxe takes the dreadnought design to new heights. 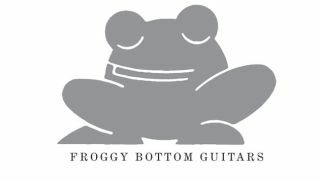 For more information on Froggy Bottom please visit The North American Guitar website, or call 0207 835 5597 or email hello@thenorthamericanguitar.com. You can also connect with them via Facebook, Twitter and YouTube.